Liczba stron: 281 Jest to ujednolicona liczba stron, która ułatwi Ci porównanie długości książek. Każda strona Legimi to 200 słów. The Scottish folklorist J.F. Campbell pieced together the tale of the Celtic Dragon, an intricate oft-told story involving not just dragons but mermaids, giants, and sidhe (fairies). This story, or portions thereof, is found in many Indo-European folklore traditions, as far afield as India. Campbell includes not only his merged narrative, but original Gaelic texts for two of the episodes. Campbell is best known for his four volume Popular Tales of the Western Highlands, also available at this site. The book includes a contribution by George Henderson, the Gaelic text and an English translation of the related tale of Fraoch and the Dragon.About Author:John Francis Campbell (Scots: Iain Frangan Caimbeul; Islay, 29 December 1821 – Cannes, 17 February 1885), also known as Young John of Islay (Scottish Gaelic: Iain Òg Ìle) was a Scottish author and scholar who specialised in Celtic studies. Campbell was known as authority on Celtic folklore and that of the Gaelic peoples in particular. His best known published work is the bilingual Popular Tales of the West Highlands (4 vols., 1860–62), and Gaelic various texts. 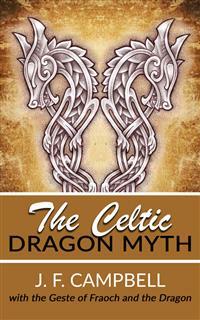 The Celtic Dragon Myth by J.F. Campbell. Between the years 1870 and 1884 the late Mr J. F. Campbell of Islay was repeatedly attracted by a series of legends current in the Highlands and Isles, which made special appeal to him as a storyologist. After reading a dozen versions of the stories, he found that no single title fitted so well as that of the Dragon Myth. "It treats of water, egg, mermaid, sea-dragon, tree, beasts, birds, fish, metals, weapons, and men mysteriously produced from sea-gifts. All versions agree in these respects; they are all water myths, and relate to the slaying of water monsters." As early indeed as 1862, while fresh from work, he had taken incidents from three versions and compared them with versions in other languages. Several journeys in the Highlands followed, as also in Japan, China, and Ceylon. While in the East, it was part of his pastimes to make sketches of the Dragons of the Orient, his mind being all the while full of the legends of the West. He regarded this as one of the most important of myths, and the most difficult to deal with. It is the State Myth of England, Russia, and Japan. He found it in the "Rig Veda," and he concluded generally that it is Eur-Aryan in the widest sense. Of his own work he expressly says that it is free translation. "I take the story from the Gaelic and tell it in my own words generally where the scribe's language is prosy. But when passages occur which seem worth preservation—bits of recitation and quaint phrases—I have translated carefully. This is work honestly done while my head was full of the subject. I think that it might interest a large number of readers… ." The manuscript is among the Campbell of Islay Collection in the Advocates' Library, Edinburgh, to the Curators of which I am beholden for their courtesy, of which I now make public acknowledgment, in enabling me to complete at Glasgow University Library the transcription which I had begun many years ago. For him the subject had two distinct aspects: first, the story is amusing for children; secondly, it has a scientific interest for a large and growing number of scholars. He had heard in London Mr Ralston give his lectures upon Russian stories, and found that the children in the audience were much amused. But amongst the audience were also Thomas Carlyle, Professor Owen, Sir R. Murchison, Reeve, Lady Ashburton, Miss Dempster of Skibo, and a number of learned people who wanted to know "the philosophy of the subject." For Mr Campbell thought there was a great deal of philosophy in it, and he states: "I want readers, wise and foolish, to be equally well treated. The foolish may read the story, the wise may read both story and notes." He had read parallel stories in Swedish, German, French, Italian, English, and had heard outlines of Russian versions which seemed to him more mythical and nearer the original shape. He even found a part of the story in a book of Swahili tales told at Zanzibar. e.g., a well is a serpent, an apple tree is another serpent, a cushion in á meadow is a third serpent transformed. Three brothers are concerned in Russian. In Swedish the serpent-slaying heroes are born of maidens who in one instance drink of a well, and in the other eat an apple. Three brothers are concerned in the adventures in Gaelic in one case, and incidents enough for three are in the several versions; if they were combined, Gaelic Swedish and Russian together would make something like a fragment of mythology, but the Gaelic versions give the largest quantity of materials." , No. IV., Popular Tales of the West Highlands, p. 72. Hector Urquhart and John Mackenzie, Inveraray.
. Hector Maclean and B. Macaskill, Berneray. MS.
. John Dewar; J. MacNair, Clachaig, Cowal. MS.
. B. Macaskill, Berneray; and Hector Maclean. MS.
. Hector Maclean and Alexander MacNeil, Ceanntangaval, Barra. MS.
. Hector Maclean and John Smith, Polchar, S. Uist. MS.
. J. Dewar; J. MacNair, Clachaig, Cowal. MS.
. MS. notes by J. F. C., and John MacPhie, vol. i., Popular Tales. Interleaved copy, second recitation.
. Pp. 328, 346 of English Collection by J. F. C. Notes and MSS. from an Irish blind fiddler on the Loch Goil Head steamer. Interleaved copy. Popular Tales, vol i., p. 71. Aug. 22, 1870. "John Mackenzie, fisherman, can repeat the story as printed from his telling in my book. Kenmore, Inveraray." (Little John the Fisher's Son); p. 42 of J. F. C.'s Journal for Sept. 1, 1870. From Malcolm MacDonald, fisherman, Benmore Cottage, Mull. 1 The reciter of Leigheas Cois’ O Céin, published by me in the Transactions of the Gaelic Society of Inverness. 15. Fionn Mac A Bhradain agus Donnchadh mac a’ Bhradain. From — Maclean, fisherman, Bunessan, Ross of Mull. "There was once a great city that depended for its water-supply upon a fountain without the walls. A great dragon, possessed and moved by Satan himself, took possession of the fountain and refused to allow water to be taken unless, whenever people came to the spring, a youth or maiden was given to him to devour. The people tried again and again to destroy the monster, but though the flower of the city cheerfully went forth against it, its breath was so pestilential that they used to drop down dead before they came within bowshot. 2 J. E. Hanauer's Folk-Lore of the Holy Land, p. 56. Arculf's stories of St George, learned in Constantinople, reached Iona in the seventh century (v. Adamnan: De Sanctis Locis). 3 Gould's Mythical Monsters, p. 306 (London: W. H. Allen & Co., 1886). As a naturalist, this writer considers the dragon no mere offspring of fancy, but infers it to be a long terrestrial lizard, with much in common with Draco volans, Moloch horridus. Fond of bathing and basking in the sun. Habitat, highlands of Central Asia. For the rest he gives interesting accounts by Mr Maclean, minister of Eigg, in 1809, and by Mr Macrae, minister of Gleneig, in 1872, of the so-called Norwegian Sea-Serpent in the West Highlands. 4 Cf. Campbell's Circular Notes, I., 326.
who had eight children have at last only one girl left. They are in great grief. The hero, So-sa-no-o no mikoto, went to the sources of the river Hi-no-ka-mi at Idzumo and found an old man and woman clasping a young girl. "If you will give that girl to me I will save her." The mikoto changed his form and assumed that of the girl: he divided the room into eight divisions, and in each placed one saki tub. The serpent approached, drank the saki, got intoxicated, and fell asleep, whereupon the mikoto drew his sword and cut the serpent into pieces! Which proves the unwisdom of the Japanese serpent in drinking saki, and the observant mind of So-sa-no-o! In China the dragon is the emblem of imperial power: a five-clawed dragon is embroidered on the Emperor's robes, with two legs pointing forwards and two backwards. Sometimes it has a pearl in one hand and is surrounded with clouds and fire. The chief dragon is thought to have its abode in the sky, whence it can send rain or withhold it. Its power is symbolised in the Emperor. Come not between the Dragon and his wrath!" St Samson is said to have seized the dragon and thrown it into the sea. Among the Welsh, indeed, a pendragon came to mean a chief, a dictator in times of danger. And if we surveyed the lives of the saints, it would be tedious to enumerate the number who figure as dragon-slayers—all of them active long ere the days of the modern Mediterranean shark! (The Leviathan that surrounds the world). 5 Leabhar Na h-Uidhri, 85b. 6 Rhys, Arthurian Legend, 157. "But the monster, which was lying in the river bed, and whose appetite was rather whetted for more prey than sated with what it already had, perceiving the surface of the water disturbed by the swimmer, suddenly comes up and moves towards the man as he swam in mid-stream, and with a great roar rushes on him with open mouth, while all who were there, barbarians as well as brethren, were greatly terror-struck. The blessed man seeing it, after making the Salutary sign of the cross in the empty air with his holy hand upraised, and invoking the name of God, commanded the ferocious monster, saying: 'Go thou no further, nor touch the man; go back at once.' Then, on hearing this word of the saint, the monster was terrified, and fled away again more quickly than if it had been dragged off by ropes, though it had approached Lugne as he swam so closely that between man and monster there was no more than the length of one punt pole." 7 Nineteenth Century, March 1895, p. 422. 8 Vitae Sanctorum Hiberniae, ed. Plummer, Tomus Primus, p. 15. 9 Bk. II., c. 27 (trans. W. Huyshe). For a dragon contest, see Nennius,. Historia, xl.-xlv. driven and chased by the dreadful wurrum which dwells in it. It bit him on the back and hunted him all the way home, where he arrived naked and bleeding." In the Life of St Mochua of Balla it is recounted that no one ventured to pursue a wounded stag that fled to an island in Lough Ree, on account of a horrible monster that infested the lake and was wont to destroy swimmers. A man was at last persuaded to swim across, but as he was returning the beast devoured him. "Draco magnus deterrimus terribilis et antiquus qui fuit serpens lubricus sapientior omnibus bestiis… ." "There lived once upon a time in Sutherland a great dragon, very fierce and strong. It was this dragon that burnt all the fir woods in Ross, Sutherland, and the Reay country, of which the remains, charred, blackened, and half-decayed, may be found in every moss. Magnificent forests they must have been, but the dragon set fire to them with his fiery breath, and rolled over the whole land. Men fled from before his face, and women fainted when his shadow crossed the sky-line. He made the whole land desert. And it came to pass that this evil spirit, whom the people called the 'beast' and 'Dubh Giuthais,'10 came nigh to Dornoch as near as Lochfinn, and when he could see the town and spire of St Gilbert, his church—'Pity of you, Dornoch,' roared the dragon. 'Pity of you, Dornoch,' said St Gilbert, and taking with him five long and sharp arrows, and a little lad to carry them, he went out to meet the 'beast.' When he came over against it he said, 'Pity of you,' and drew his bow. The first arrow shot the beast through the heart. He was buried by the towns-people. Men are alive now who reckoned distance by so or so far from the 'stone of the beast' on the moor between Skibo and Dornoch. The moor is planted, and a wood called Carmore waves over the ashes of the destroying dragon." This church, Miss Dempster notes, was built between 1235-45, burnt 1570, and rebuilt 1614; it was repaired in 1835 by the Duchess, Countess of Sutherland. While the work was going forward the tomb of the founder, Gilbert, Bishop of Caitness, called St Gilbert, was discovered. The saying went in Sutherland that when this happened, the cathedral would fall at mid-day the following Sunday; and Mrs Dempster well remembered seeing a third of the congregation (Gaelic) camped out on the hill above the town, expecting to see the fall of the roof; nor did many of the oldest inhabitants go to church for several following Sundays. 10 There is still an old pronunciation with t hard, and not th. creature covered all over with rags and ribbons, typifying the wind-tossed surface of the waves. His appearance is a portent of a drowning soon to follow. "Now, the story tells us that there was at that time in Ireland a monstrous dragon which devoured the people and wasted the land; so that the king at last had sworn a solemn oath that whoever slew the monster should have the Princess Iseult to wife; and because of the beauty of the maiden and the fierceness of the dragon, many a valiant knight had lost his life. The land was full of the tale, and it had come to Tristan's12 ears, and in the thought of this had he made his journey. "The next morning, ere it was light, he rose and armed himself secretly, and took his strongest spear, and mounted his steed, and rode forth into the wilderness. He rode by many a rough path till the sun was high in the heavens, when he turned downwards into a valley, where, as the geste tells us, the dragon had its lair. Then he saw afar off four men galloping swiftly over the moor where there was no road. One of them was the queen's seneschal, who would fain have been the lover of the Princess Iseult, but she liked him not. Whenever knights rode forth bent on adventures, the seneschal was ever with them for nothing on earth save that men might say they had seen him ride forth, for never would he face the dragon, but would return swifter than he went. "Now, when Tristan saw the men in flight he knew the dragon must be near at hand, so he rode on steadily, and ere long he saw the monster coming towards him, breathing out smoke and flame from its open jaws. The knight laid his spear in rest, and set spurs to his steed, and rode so swiftly, and smote so strongly, that the spear went in at the open jaws, and pierced through the throat into the dragon's heart, and he himself came with such force against the dragon that his horse fell dead, and he could scarce free himself from the steed. But the evil beast fell upon the corpse and partly devoured it, till the wound from the spear pained it so sorely that it left the horse half-eaten, and fled into a rocky ravine. 11 Löseth, Le Roman en prose de Tristan. For variants of the dragon fight, v. Hartland's Legend of Perseus, vol. iii. 12 Tristan and his uncle Mark, Zimmer thinks, are ninth-century Pictish chieftains. Iseult he takes to be the daughter of the Viking King of Dublin. would be his death. For the dragon had as aids smoke and flame, teeth and claws sharper than a shearing knife; and the knight had much ado to find shelter behind the trees and bushes, for the fight was so fierce that the shield he held in his hand was burnt well-nigh to a coal. But the conflict did not endure over-long, for the spear in the vitals of the dragon began to pain him so that he lay on the ground, rolling over and over in agony. Then Tristan came near swiftly and smote with his sword at the heart of the monster so that the blade went in right to the hilt; and the dragon gave forth a roar so grim and terrible that it was as if heaven and earth fell together, and the cry was heard far and wide through the land. Tristan himself was well-nigh terrified, but as he saw the beast was dead he went near, and with much labour he forced the jaws open, and cut out the tongue; then he closed the jaws again, and put the tongue in his bosom. He turned him again to the wilderness, thinking to rest through the day, and come again to his people secretly in the shadows of the night; but he was so overcome by the stress of the fight and the fiery breath of the dragon that he was well-nigh spent, and seeing a little lake near at hand into which a clear stream flowed from the rock, he went towards it, and as he came to the cool waters the weight of his armour and the venom of the dragon's tongue overpowered him, and he fell senseless by the stream. 13 From Gottfried von Strassburg's Tristan and Iseult, by J. L. Weston, I., 89, 98, 123. Cf. also Bedier's French retelling, Englished by Mr Belloc. 14 Trevelyan, Folk-Lore and Folk-Stories of Wales, p. 165.
recalls an Irish name for the Milky Way—bóthar bó finne (the way or path of the cow of whiteness) . But in Uist I met with the name Sliochd Uis (Milky Way), meaning seemingly "the path or way of whiteness or brightness," the root of which recurs again in Uisne (Uisnech). The Yellow Book of Lecan; Edinburgh Advocates’ Library Gaelic MS. XL. ; Egerton 1782 (British Museum). This old story has been edited with all the important variants, with his wonted care and skill, by Professor Kuno Meyer in the Zeitschrift für Celtische Philologie for 1902. In making my translation I tried to select from among the best of the variant readings. The last seven sections of the Táin Bó Fráich I have not translated here: they are apart from the Geste of Fraoch, and bring the hero of the narrative on further adventures elsewhere. This tale is one of the oldest of our secular narratives in Gadhelic: it belongs to about the ninth century, a period when the Scoto-Celtic idiom of Alba was one with the language of Erin. A translation was made by the late Mr J. O’Beirne Crowe, which appeared in the Royal Irish Academy Proceedings for 1870, but subsequent studies have necessitated many changes. "He set out early in the morning with nine men, till he reached Ath Fuait. He saw the warrior bathing in the river. "'Wait here,' said Fraech to his retinue, 'till I come to the man yonder; not good is the water,' said he. "He took off his clothes, and goes into the water to him. 15 MacAlister's Irish Oghams, pt. 3, p. 213; Journ. Roy. Soc. Antiq. Ireland, 5 ser. "'Settle it as you like,' said Cuchulainn. "'The hand of each of us round the other,' said Fraech. "They set to wrestling for a long time on the water, and Fraech was submerged. Cuchulainn lifted him up again. "'This time,' said Cuchulainn, 'will you yield and accept your life?' "'I will not suffer it,' said Fraech. "Cuchulainn put him under it again, until Fraech was killed. He comes to land; his retinue carry his body to the camp. Ath Fraich, that was the name of that ford for ever. All the host lamented Fraech. They saw a troop of women in green tunics16 on the body of Fraech mac Idaid; they drew him from them into the mound. Sid Fraich was the name of that mound afterwards." Ailill's plan in compassing the death of Fraoch recalls his episode with Fergus, son of Rōg. Keating17 tells how, when Fergus was in banishment in Connaught, it happened that he was with Ailill and Mève in Magh Ai, where they had a fortress; and one day, when they went out to the shore of a lake that was near the lios (or outer court), Ailill asked Fergus to go and swim in the lake, and Fergus did so. While swimming, Mève was seized by a desire of swimming with him; and when she had gone into the lake with Fergus, Ailill grew jealous, and he ordered a kinsman of his to cast a spear at Fergus, which pierced him through the breast; and Fergus came ashore on account of the wound caused by that cast, and extracted the spear from his body and cast it in the direction of Ailill; and it pierced a gray hound that was near his chariot, and thereupon Fergus fell and died and was buried on the shore of the same lake.